Are you considering a change in your career? Perhaps you’ve reached a point where you’ve grown bored with your office job, don’t see yourself there in five or even ten years, or maybe you just finally feel like you have the time to pursue your dream. Whatever it is, you’re here for a reason, and we’re here to help you get started. At San Francisco School of Massage & Bodywork, we strive to create an environment for our students that is focused on learning, growth, and achieving mutual goals. 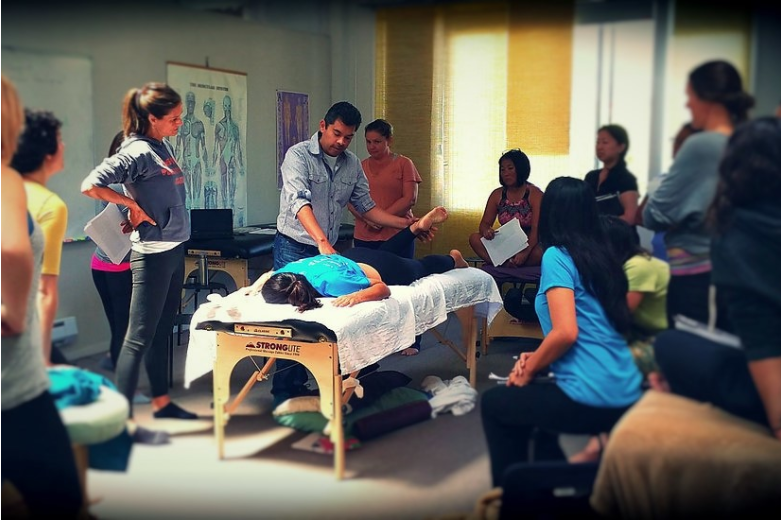 Are In-Person Massage Therapy Courses Better? Individualized attention – Whether you need help learning a specific technique or require further explanation, having an instructor in front of you who can provide real-time feedback will help you learn. Our teachers are dedicated to providing our students with diverse and personalized instruction, so you can rest assured you are learning from the best. Group learning – By learning with a group of students, you learn better. You can watch others, work together, support one another, and pace yourself accordingly. Environment – By coming to our campus and learning with us, you will be distraction-free and can better focus on your improvement. Additionally, many people learn better in a setting that focuses them. Being in the mindset and physically in the environment dedicated to Massage Therapy improves retention. Practice – This one might seem obvious, but you can’t practice on anyone if you are alone learning on your computer. Though you might know the techniques, nothing beats actually performing your new skills on real life people. The above are the main reasons that we advocate for in-person courses and because online courses do not prepare you to pass the state exam to become a licensed professional. Explore our Massage Therapy program and see if SFSM is right for you; we’ll be happy to figure out the best schedule for you and make sure your time with us is rewarding. We can’t wait to meet you!